One last weekend of vending! The shady lane that Storied Threads will call home this Columbus Day weekend. At the end of 2016, I hung up my vendor hat, and resolved to simply sell online. I got a fantastic new job at The Hanover Theatre for the Performing Arts, and let Storied Threads become a side gig again. It was a good choice. It relieved a lot of stress I’d been under, and I’ve been very happy with the ways in which my life has improved. The one thing I’m not happy with is the several bins of leftover stock still sitting in a closet in my house. So, when The Connecticut Renaissance Faire realized that their new site allowed for one-weekend pop-up vendors, I decided to dust off that vendor hat and give it one more go! For three days this coming weekend, October 7 – 9, I will be selling patches, bags, scarves, headbands, and anything else I find lurking in that closet out of a lovely, shady booth at the Faire! Many of the items will be marked down well below their full online price, and we’ll also have items that have been discontinued or were never available online, such as head bows and bow ties. Come check us out and shop with us in person – one last time! 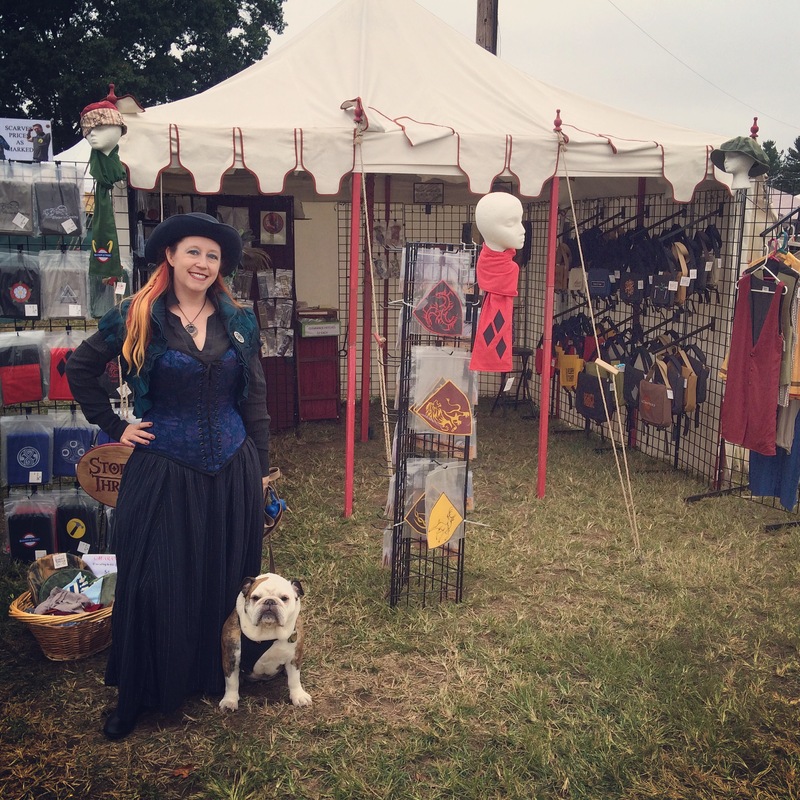 Storied Threads Returns to the Connecticut Renaissance Faire – One Weekend Only! Our last full set-up at the Connecticut Renaissance Faire, fall 2016. When Storied Threads first started out more than a decade ago, our first show set-up was at the Connecticut Renaissance Faire, in a wooden stall at the edge of a county fairgrounds. It’s perhaps appropriate then we’re coming full circle and will have a similar arrangement when we return to CTRF for the last weekend (October 7 – 9) of its six-week run at the Lebanon Fairgrounds in Lebanon, CT! This is going to be a very special one-time-only appearance for us. We decided last year to stop actively doing conventions and faires and we’re happy with that decision, but we have quite a bit of stock left over from our shows days, including retired designs and convention-only items that aren’t part of our online catalog — and we’re going to be making those items available at CTRF at deeply discounted prices, and once they’re gone we won’t be making more, so this will be your last chance to grab a bow tie, hair bow, or our very last TARDIS Christmas stocking. But that’s not all! We have a number of bags, scarves, and neckties that are available online, but we’re looking to clear out our closet, so we’re marking those down too, but only for this show! Once we sell out of the on-hand stock we bring to the faire, everything will go back to its full retail list price. In addition, we will have a limited selection of our patches, which will be sold at their regular list price. So now in addition to the great shows and other awesome vendors, you all have even more reason to come to the faire. Come by, say hi, and maybe do some early holiday gift shopping! The OtherWhere Market Holiday Affaire! Our next and final show is coming up! 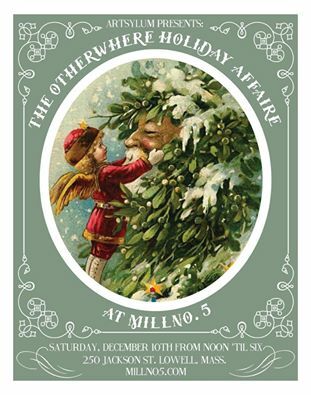 The OtherWhere Holiday Affaire is Saturday, December 10 at Mill No. 5 in Lowell, MA starting at noon. This is a great show featuring local artists and crafters specializing in offbeat wares, and it’s hosted by one of the coolest venues we’ve ever worked in Mill No. 5, which has been designed to look like a street in Victorian London. And this is a special show for us because it’s our last one. We’re going online only for the foreseeable future, and we may return to doing conventions, renaissance faires, and shows like OtherWhere sometime down the road, but until then you can always find us online. We’re very sad that our preferred candidate, Leslie Knope, did not win the presidential election. VERY sad. But on the bright side, there’s still a chance for Leslie to become the first women president. That’s good news, right? Anyway, now that the 2016 election is over (finally! ), we will be retiring our Knope/Wyatt 2016 patches. HOWEVER! We will be updating them in anticipation of the 2020 election, so they will return in a new form. Until we update the patch, we will keep the original version up on out website. If you happen to be at Rhode Island ComicCon this weekend, we will have a special opportunity for you. We have three Knope/Wyatt 2016 patches in stock we’re looking to clear out, and they will be bargain priced at a mere $2 each! It’s first come, first served on these clearance-priced patches, so get there early if you want to snag one. Please be aware this bargain pricing is an RICC exclusive offer and any patches ordered through the website will be full priced at $9. If you want to take advantage of a few more bargains, visit our booth at RICC because we’ll have a lot of stuff price to move and we’ll be offering a five percent discount on purchases totaling $50 or more, and a 10 percent discount on orders totaling $100 or more! This discount is applicable only to regular priced items; already discounted items and special orders placed at the convention are not eligible toward the discount. On a more serious and less self-promotional final note, Storied Threads wants every RICC attendee to know that we are a Themyscira-designated safe space. If you are being harassed or being made to feel uncomfortable while at the con, please come to us and we will take care of you. When: Every weekend in October, including Columbus Day Monday! This will be our eighth – and final! – year vending at the Connecticut Renaissance Faire. We’ve been with them through several locations, and have enjoyed every minute of our time there, and I’m so looking forward to the next four weekends with my faire family that I cannot even express it. Yes, you heard me right – giant Connect Four! This weekend will be the second of the show’s five weekend run, and will be EVEN BETTER, as we’ll be joined by Shakespeare Approves, Zoltan the Adequate, and The Lost Boys (alhtough that last will be for this weekend only, alas). We’re pretty easy to find once you’re on site — we’re located right between the gazebo where so many musical acts perform, and the giant free-to-play Connect Four. Every weekend has a different theme – this weekend is Pirate Invasion – so come visit as often as you’d like! Although this convention has been around for over ten years now, this will be the first time for Storied Threads vending there. We’re very excited to be heading up to New Hampshire to hopefully start our autumn off with a bang! You can find us in the dealer’s room in spaces N3 and N4 (cirled in red on this map) all weekend long.